I've been investing in long rayon festival dresses as of late. I'm finally accepting my love of all things rayon and linen. I mean, I live in sort of an intellectual hippy town where rayon is practically the hippie lady uniform (the preppy lady uniform is leather boots, skinny jeans, and a flowy chiffon top). I keep getting neighbors' hand me down dresses and friends' lace edged french countryside tops. Not to mention somehow acquiring a bunch of comfy hand dyed linen pants & yoga gear. Is this just my lot in life? Do I have a natural fabric destiny? Or maybe just a destiny to feel really chill and earthy this Summer whilst frolicking around at music festivals and braiding flowers into chains and other girly fairy stuff. Speaking of natural stuffs, our tiny plot of greens (kale, arugula, spinach) is SO dang happy. Logan and I decided not to plant a big garden this year. Our plot has a number of edible fruit trees and established berry patches that are enough work to deal with already (on top of working on our other projects). Plus, as Logan says, we don't own the land so what's the point of putting in the work on the soil, or building raised beds if we don't get to keep them? A lanky red poppy catching the breeze in my front yard. A petal or two drifting off after heavy rain. Entranced by the washboard and musical saw stylings of Bonnie Paine at the Elephant Revival show. Clear cold water up to my knees at a Sugar Hollow swimming hole. Logan lounging on a granite rock. A clutch of thumbnail sized purple moths gathered around a pebble, exploding out and away as we step back onto shore. Drinking ginger kombucha out of tall beer glasses at The Whiskey Jar. Good conversation with one of our best friends. Smell of thick, sweet cigar smoke hitting us downwind of a large, puffing balding man celebrating nothing in particular. Stirring egg yolks and sugar into strawberry-rhubarb puree. And hey have you guys ever had fresh gnocchi? I tried it for the first time over the Winter. I was shocked at how easy it was to bring the dough together, roll out the cute little gnocchi pillows, and cook them until done. 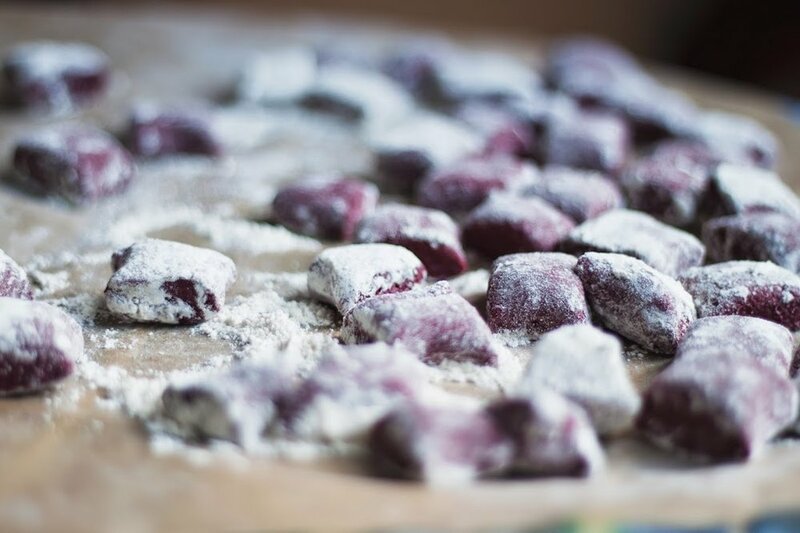 I had made butternut squash gnocchi before, so I figured beet gnocchi would work similarly. The roasted beets gave the pasta an sweetness that I really love. And the characteristic "earthy" beet flavor was really light, if not totally removed by the addition of the nutty, lemony einkorn flour and balancing balsamic. And the pesto. I've never been a huge fan of raw garlic, and my feelings don't change on the matter when it comes adding it to sauces or condiments. The pungent, sweet roasted garlic thrown into this pesto makes for a more mellow flavor profile -- much softer than the biting, fiery stickiness of raw garlic. If you're a fan of parsley (and, ahem, garlic of course), this pesto is for you. I've also been spreading it on toast topped with an egg for breakfast! Combine beet puree, black pepper, salt, and balsamic in the bowl of your food processor. Pulse to combine. Add einkorn flour 1/2 cup at a time, pulsing to combine after each addition, until the dough comes together. You want a soft, elastic, pliable dough. If your dough is too sticky and hard to handle, add 1/4 cup more flour at a time until you've reached the desired consistency. Separate dough into six equal portions. Set a stockpot filled 3/4 full with salted water ("It should be like the Mediterranean Sea!" So says Mario Batali) on the boil. Flour a surface and your hands and roll out six dough portions into equally thick logs, about .5 inches thick and 7 to 9 inches long. Flour a sharp-edged knife and cut logs into 1 inch long pieces. Press the tops gently with a fork if you'd like to add a design. Reduce heat of your boiling pot of water to a simmer, and add half of your gnocchi. They'll sink to the bottom -- run a spoon around the bottom of the pot to lift them off and keep them from sticking. In about 5 to 8 minutes, when the gnocchi have started floating to the top, give them another minute. Remove to a plate using a slotted spoon and repeat the process with the second half of the gnocchi. *How to prepare your beet puree: Preheat oven to 400F. Peel and chop beets into 1 inch chunks (about 2.5 cups total; I used two extra large beets). Toss beets in 1 tsp coconut oil. Roast beets on a parchment lined baking sheet for 30 minutes. Cook until fork-tender. I added about 1/8 cup water to my pan after 20 minutes to keep them from crisping up -- you want them soft and not overly dried out. Puree beets in food processor 3-5 minutes, until you've reached a silky texture. **Roast 5 cloves of garlic along with the beets, to be used in your pesto. Garlic is done once soft and gently browned -- I removed mine after 15 minutes on 400F, roughly.